the gradient of the channel. Not all energy is available to erode or transport sediment. Friction with the bed and banks and turbulence reduces energy. The faster the flow of water (velocity), the greater the turbulence. Water with a more turbulent flow can transport more sediment. Velocity is affected by three main factors. These are channel slope, the roughness of the channel’s bed and banks and the cross-section channel shape. The hydraulic radius is the term used to describe the shape of a channel. 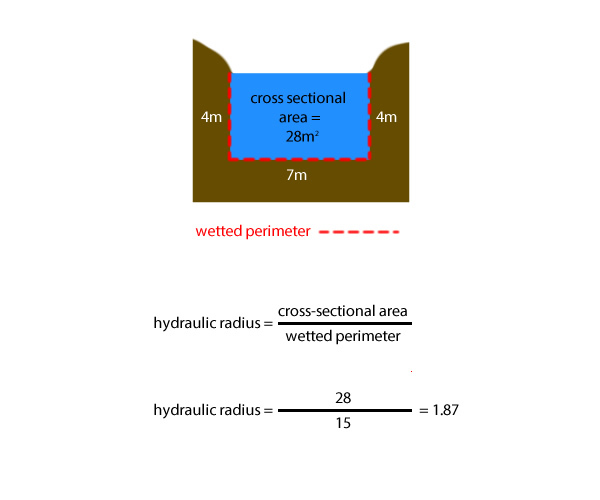 It is the ratio between the length of the wetted perimeter and the cross-section area. The higher the hydraulic radius the lower the amount of water in contact with the bed and banks which means there is less friction and water can move at a higher velocity. A range of river elements can be measured by A Level Geography students. These include changes in depth and width or rivers, the type of bed load (size/roughness etc), channel and flow characteristics, stream gradient and channel profiles.